Should we burn waste plastic - or bury it? Since China refused last month to accept any more foreign waste for recycling, the UK is facing a challenge. How can it recycle more of its own waste? And should it bury or burn the low-grade waste that it can't recycle? We're trying to answer the second question. And it certainly divides opinions. So what are the facts about plastic waste? Well, according to the HMRC's UK trade info website, about 800,000 tonnes of plastic waste was exported from the UK for recycling to nations like China in 2014. News reports suggest much of this was contaminated by other rubbish, and had to be burned. The UK itself was left with 1,244,774 tonnes of packaging sent either to landfill or incineration in 2016. The National Packaging Waste Database estimates that 1,015,226 tonnes of plastics packaging was recycled in 2016. Remember, this is packaging, not all plastic waste. So should we burn our hard-to-recycle waste, or bury it? Here's the case for burning. Plastic is made from oil and gas, and it creates a lot of heat when it's burned. So at first sight it makes sense to harness that by burning it in an incinerator to make electricity. It's even more efficient if the incinerator can capture the waste heat from the process and use it to warm offices and homes. Burning plastic this way currently substitutes in some places for burning dirty fossil fuels like oil or coal. Mark Pawsey, the Conservative MP for Rugby, is chairman of the All-Party Group for the Packaging Manufacturing Industry. He told the Commons: "Waste is used to generate the heat that enables the cement company based in my constituency to manufacture cement. "That strikes me as a much better use of the calorific value of packaging than sending it to landfill." His argument is supported by the people who run incineration - the Environmental Services Association (ESA). Its director Jacob Hayler told us: "It is better to recover energy from non-recyclable waste through (incineration), than send it to landfill." He quotes the government's Digest of UK Energy Statistics (DUKES) saying that in 2016, the waste used to fuel Energy from Waste (EfW) was equivalent to replacing 2.5m tonnes of virgin fossil fuel oil. Mr Hayler says that overall greenhouse gas emissions from incineration are lower than from landfill. So it seems there's a strong case for incineration - but it's not quite that simple. Because those statistics are based on the incineration of general waste including plastics - not of plastic waste alone. Much of our household waste in landfills does indeed create greenhouse gases that heat the world, unless they are captured as landfill gas. But this doesn't apply to plastics, which are extremely stable. They don't break down in landfill, so don't emit greenhouse gases. And, in fact, there's a strong case against incinerating plastics. So what's the case for burial? Burning plastic creates harmful dioxins and if incinerators are inefficient, these leak into the environment. Modern incinerators are said to have largely solved this problem. But climate change is another consideration. The consultancy Eunomia says plastics burned in incinerators set up to generate only electricity create heat at 25% efficiency. This is much lower than the 55% efficiency for new gas-fired power stations. Dominic Hogg from Eunomia told BBC News: "When coal is phased out for generating electricity, incineration of unrecycled waste will be the most CO2-intensive form of generation. "This doesn't make sense if the government's trying to reduce CO2 emissions - unless the government takes drastic action to reduce the amount of plastic in unrecycled waste." Environment groups also fear that if the UK builds new incinerators to cope with the stockpile created by China's rejection of waste plastic, the policy will lock in a demand for burning waste plastic that ideally should get recycled. The government seems to have been persuaded by this argument. 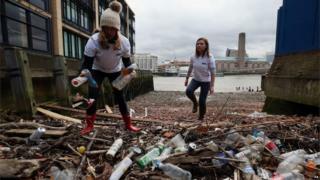 The environment minister Therese Coffey told the Commons: "In environmental terms, it is generally better to bury plastic than to burn it." Indeed we could go one step further and make the case that burying waste plastic in landfill is actually a cheap form of carbon capture and storage. Governments have been promising for decades to develop plants that will capture the carbon emissions from power stations and force them into underground rocks. Burying plastic would have the same effect of locking up unwanted carbon at a fraction of the cost. Elena Polisano, Oceans Campaigner for Greenpeace UK reluctantly agrees. She told BBC News: "We should reduce, reuse, and recycle, in that order. "When we get to the stage of deciding whether to burn or bury waste, we have already failed, failed some more and then failed again. "However, it is safer to contain that failure than to spread it through the atmosphere in the form of toxic gases." The question may seem rather academic. But it is highly pertinent for a government whose environment secretary is preparing a new plan for waste - and who has stated that the UK must "stop offshoring our dirt". Roger Harrabin reports on waste for Radio 4s' PM programme throughout the week.